Acknowledged author Muhammad H. Rashid wrote Power Electronics: Circuits, Devices & Applications (4th Edition) comprising 1024 pages back in 2013. Textbook and etextbook are published under ISBN 0133125904 and 9780133125900. 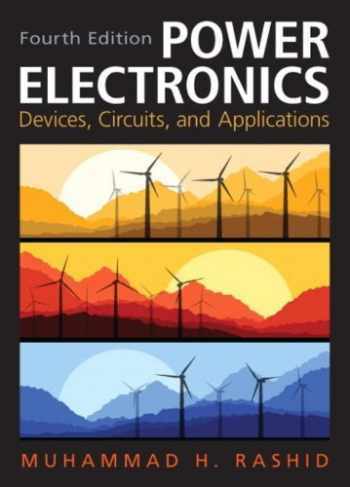 Since then Power Electronics: Circuits, Devices & Applications (4th Edition) textbook was available to sell back to BooksRun online for the top buyback price of $37.39 or rent at the marketplace. For junior or senior undergraduate students in Electrical and Electronic Engineering. This text is also suitable for individuals interested in the fields of electrical and electronic engineering. This text covers the basics of emerging areas in power electronics and a broad range of topics such as power switching devices, conversion methods, analysis and techniques, and applications. Its unique approach covers the characteristics of semiconductor devices first, then discusses the applications of these devices for power conversions. Four main applications are included: flexible ac transmissions (FACTs), static switches, power supplies, dc drives, and ac drives.